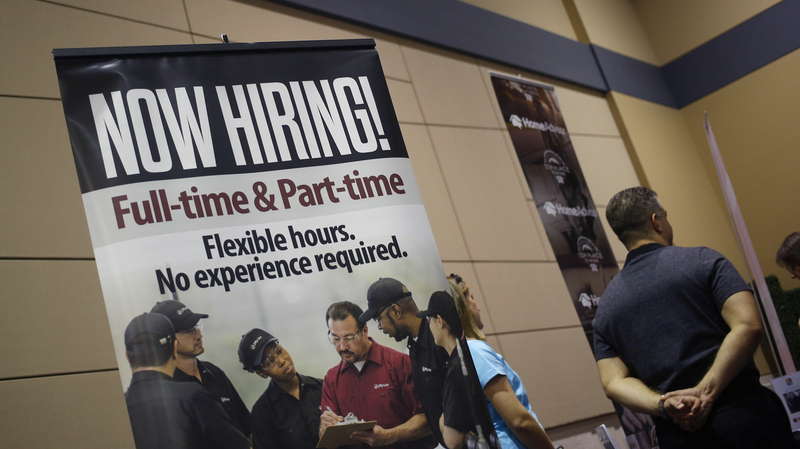 May Jobs Report: 138,000 More On Payrolls; Unemployment Dips Slightly : The Two-Way The national unemployment rate nudged lower to 4.3 percent — the lowest it has been in 16 years. A "Now Hiring!" sign is displayed next to the Jiffy Lube International booth at a jobs fair in Overland Park, Kan., in March. The U.S. economy added 138,000 jobs in May, according to the monthly jobs report released by the Bureau of Labor Statistics on Friday morning. The national unemployment rate nudged lower, to 4.3 percent from 4.4 percent — a 16-year low. The 4.4 percent level had been the lowest since since 2007, before the recession hit. But the jobs numbers were not as strong as some were hoping to see. Economists had been expecting job gains of about 185,000, NPR's Yuki Noguchi reports, and to see the unemployment rate holding steady. Last month's report initially showed job creation bouncing back in April, with the economy adding 211,000 jobs to nonfarm payrolls. That figure was revised to 174,000 Friday, a drop of 37,000. Revisions also cut disappointing March results even further, from a gain of 79,000 to a gain of only 50,000 jobs. The numbers suggest job growth is slowing slightly, The Associated Press reports, with an average gain of roughly 121,000 jobs over the past three months, compared with an average of 181,000 over the past 12 months. Still, in May, the number of unemployed Americans (6.9 million) remained essentially unchanged from the previous month. "Since January, the unemployment rate has declined by 0.5 percentage point, and the number of unemployed has decreased by 774,000," the BLS said. "Among the unemployed, the number of job losers and persons who completed temporary jobs declined by 211,000 to 3.3 million in May," according to the BLS report. The Department of Labor also recently released more specific data about the job markets in different U.S. cities. For metropolitan areas in April, the agency says Ames, Iowa, and Boulder, Colo., had the lowest unemployment rates, at 1.7 percent and 1.8 percent, respectively. The highest unemployment rate was in El Centro, Calif., at 19.2 percent. For large cities (with a population over 1 million in the 2010 Census), the Denver area had the lowest unemployment rate, at 2.1 percent. The highest rate was in the Cleveland area, at 5.4 percent.